Use morels, black trumpets, or whatever rich-tasting mushrooms you can find. Fresh mint with earthy mushrooms is a mind-blowing combination. 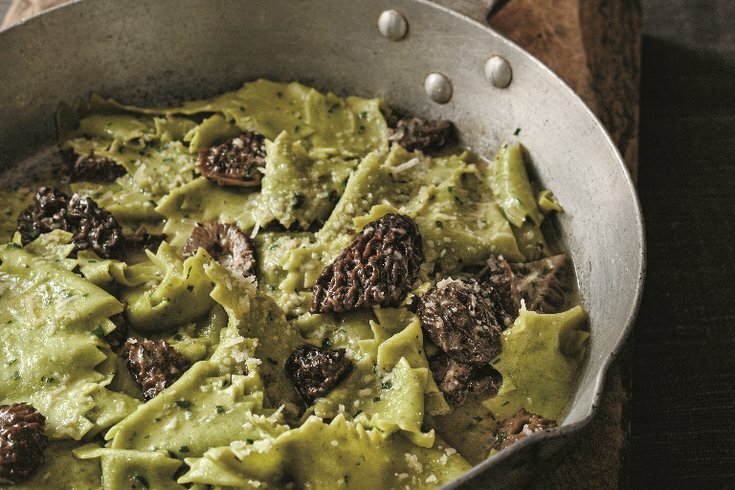 Use morels, black trumpets, or whatever rich-tasting mushrooms you can find. Whichever type you choose, the pairing should open the door to many other herb-mushroom combinations. Basil Dough or Chive Dough works well with mushrooms, too. Mint can be strong, so, as you will see in the dough recipe, I like to cut it with a little parsley to balance the flavors. You can toss a little fresh mint and parsley into the pan, too. Note: You can swap spaghetti, linguine, bucatini or any long pasta fits right in here. 3 days. Take the pasta straight from the freezer to the boiling pasta water. Heat the oil and 1 teaspoon (5 g) of the butter in a large, deep sauté pan over medium heat. When the butter melts, add the onion and garlic and sweat them until the onion is soft but not browned, 4 to 5 minutes. Add the mushrooms and cook until they soften, 4 to 5 minutes. Taste the mixture, adding salt and pepper until it tastes good to you. Remove and discard the garlic. Keep the mixture warm. Bring a large pot of salted water to a bowl. Drop in the pappardelle and cover the pot to quickly return the water to a boil. Cook the pasta until it is tender but still a little chewy when bitten, about 2 minutes. Using a spider strainer or tongs, drain the pasta by transferring it to the pan of mush- rooms. Reserve the pasta water. Add the remaining ½ cup (114 g) butter, in pieces, to the pan along with 1 cup (237 ml) of the reserved pasta water, toss- ing over medium heat until the sauce reduces slightly, gets creamy, and coats the pasta, 1 to 2 minutes. Add a little more pasta water if necessary to create a creamy sauce. Remove the pan from the heat and stir in ¼ cup (25 g) of the Parmesan. Keep the pasta moving until pasta and sauce become one thing in the pan. Taste it, adding salt and pepper until it tastes good to you. Dish out the pasta onto warmed plates and garnish with the remaining Parmesan. Purchase a copy of Mastering Pasta by Marc Vetri here. Reprinted with permission from Mastering Pasta by Marc Vetri, copyright © 2015. Published by Ten Speed Press, an imprint of Penguin Random House LLC.